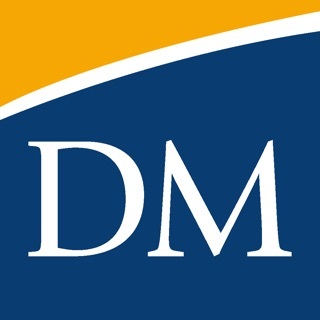 DSM PUBLIC ART 2.0 – now with a full-screen iPad layout! 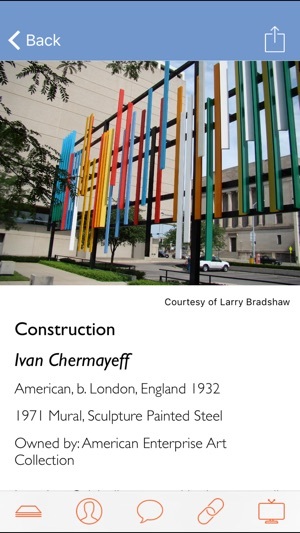 This app offers a fantastic experience to engage and inspire you with the best of public art in Greater Des Moines, Iowa. Searching for art in public spaces? Or, perhaps you're curious about a sculpture or mural that you pass by? 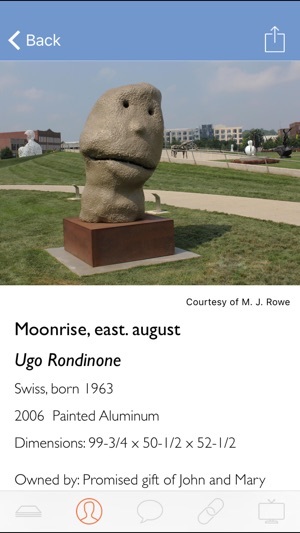 This interactive, multimedia application provides a self-guided tour of public art throughout the Greater Des Moines area. By exploring, you will discover the bold and distinctive styles of public art by artists from around the world. You will be introduced to a visual library that you can search by artist, title or location. 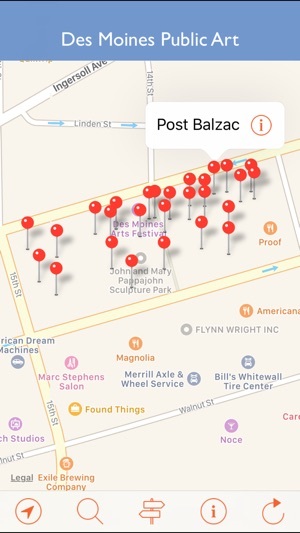 GPS tracking and detailed maps will lead you to historically venerated artists such as Edwin Blashfield, Stuart Davis, Arnaldo Pomodoro, and Henry Moore; Pop artists Claes Oldenburg and Coosje van Bruggen; Abstract artists Ellsworth Kelly, Sol LeWitt, James Rosati, and Joel Shapiro. You can discover works integrated into a particular site by artists Anna Gaskell, Jun Kaneko, Mary Miss, and Jordan Weber. There are also surprisingly innovative public works by artists Keith Haring, Jaume Plensa, and Yoshitomo Nara. 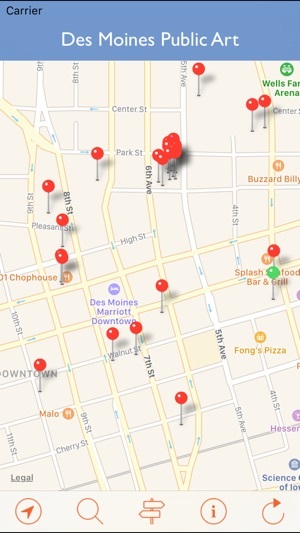 The points on the map correspond to a wide selection of public artworks within and outside the City of Des Moines. * Tap any point to read detailed information. * Zoom into particular areas, such as the Principal Riverwalk, State Capitol Grounds, Pappajohn Sculpture Park, or see a wide view of the entire city and environs. * Learn about installed art, as well as art that is planned or in progress. * Find the name of the artwork, year completed, medium or materials, the artist’s background, description of work, and artist comments. * Link to more artist information on the web, plus enjoy online videos. * Share your experiences via Facebook, Twitter, email or text message. This update includes layout improvements for newer devices, and other minor bug fixes. Showcases Des Moines Sculpture Scene! This app is really useful. 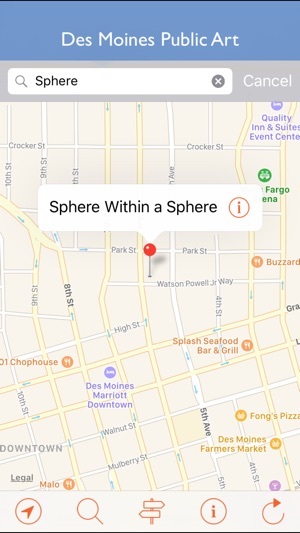 If I'm out on a walk or bike ride around downtown Des Moines and want to know more about a piece of sculpture, this app has all the info I need. A few weeks ago I was showing some out of town friends around and quickly went to this app to see who the artist was as my friend thought a similar piece was in downtown Dallas, Texas. This app had all the info we needed. YES! Gotta find that room of red light one of these days. All the rumors are true!